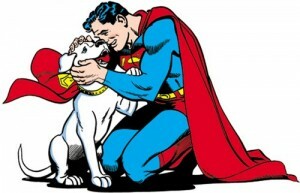 Is there a link between the DC Comics hero Superman and the lethal effects for canine pets from eating chocolate? While chocolate is an enjoyable energising treat for most humans, it’s a potentially fatal food for dogs, just as lethal as kryptonite was for Superman. Kryptonite was a material from Superman’s universe, specifically a mineral from Superman’s home planet of Krypton. Kryptonite drained Superman of his strength but gave others some of his superhuman powers. According to some animal-protection groups, the problem for dogs with chocolate lies in theobromine, a compound found in cacao. However, many scientists suggest the really lethal element is the combined dosage of all the methylxanthines in chocolate. Methylxanthines are the group of substances that includes caffeine, paraxanthine, pentoxifylline, theobromine, and theophylline. The darker the chocolate, the more drastic the disaster for your dog. However, even white chocolate and milk chocolate pose a serious danger. Methylxanthines can affect not only the airways but stimulate heart rate, force of contraction, and cardiac arrhythmias at high concentrations. In high doses, they lead to convulsions that are resistant to anticonvulsants. Methylxanthines induce acid and pepsin secretions in the GI tract. Methylxanthines are metabolized by cytochrome P450 in the liver. Some humans can experience these vulnerabilities to chocolate but do not diagnose the connection. Most people have no problem whatsoever, other than through excessive consumption of chocolate. But is there a connection between chocolate and Kryptonite from outer space? Studies reported in 2008, based on 12C/13C isotopic ratios of organic compounds found in the Murchison meteorite, suggest that methylxantines (xanthine and related chemicals), including the RNA component uracil, were formed extraterrestrially. In August 2011, a report, based on NASA studies with meteorites found on Earth, was published suggesting xanthine and related organic molecules, including the DNA and RNA components adenine and guanine, were to be found in outer space. Where is the planet Krypton? So there is a question to be asked: Somewhere nestled deep in outer space, is there a planet made of chocolate? So is there a planet that can be called Mondelēz? The possibility exists that il est au-delà de cette planète , mais où est-il au-delà des mondes que nous connaissons? Joe Lederman is the non-executive publisher of Australian Food News. He is the managing principal of FoodLegal, specialising in food regulatory compliance and food industry policy and business strategy.